Chris Hughton is preparing for the biggest single 90 minutes of his managerial career as Birmingham entertain Blackpool in the second leg of their npower Championship play-off semi-final. Hughton watched his side emerge from Friday night&apos;s first leg at Bloomfield Road on the end of a 1-0 defeat, knowing a below-par performance sprinkled with chances meant the result could easily have been 3-0 as much as 1-1. Blues will now look to overturn that deficit and set up a Wembley showdown against West Ham on May 19, with the most lucrative match in world football guaranteeing the winners an immediate return to the Barclays Premier League. Hughton spent many years on the coaching staff at Tottenham and then Newcastle, where he was caretaker boss and then manager, guiding the club to the Championship title in 2010 before harshly losing his job in December of that year. But the rewards on offer over 90 minutes tomorrow makes the play-off showdown unique. "It is, yes (the biggest game), because it&apos;s the one right at this moment," Hughton said. "Certainly as a manager it is. I was involved in the coaching staff at Newcastle when the team went down on the last day of the season. "This is right up there. It&apos;s a massive, massive game for all concerned." The City boss goes into the game boasting an unchanged squad and has already settled on his XI for what promises to be a thrilling night of action played under the floodlights in front of a vociferous home crowd. St Andrew&apos;s has built a reputation over the years for creating a passionate atmosphere, something Blackpool boss Ian Holloway is well aware of. And Hughton hopes the club&apos;s fans will be in full voice for the sell-out fixture. He said: "We&apos;re at home, we&apos;ll have a full house and it can be a fairly daunting place to come and play for an opposition. "We&apos;ve got to make sure that&apos;s the case tomorrow night. "We&apos;ve also got to make sure we give them something to cheer about. It works both ways. "They&apos;re a very loyal and passionate crowd and they will get behind us and make it a very noisy St Andrew&apos;s.
"But that&apos;s one side of it. The more important side is what goes on on the football pitch and it&apos;s no coincidence we are where we are this season, that&apos;s because we&apos;ve deserved to be there and because we have been able to win games and play well for large chunks of this season. "We&apos;re up against a very good Blackpool team and they&apos;re a big threat. They have a lot of offensive options and have been very solid at the back and we&apos;ll need to test them more." 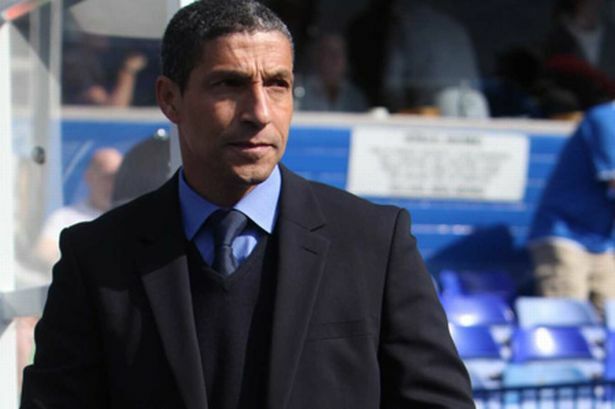 Hughton added: "I&apos;m quite sure I wouldn&apos;t have to say too much (to my players) before the game. The prize couldn&apos;t be any bigger for them. "Everybody knows what&apos;s at stake and the fact there is a 1-0 deficit, we know we have to go and win the game."